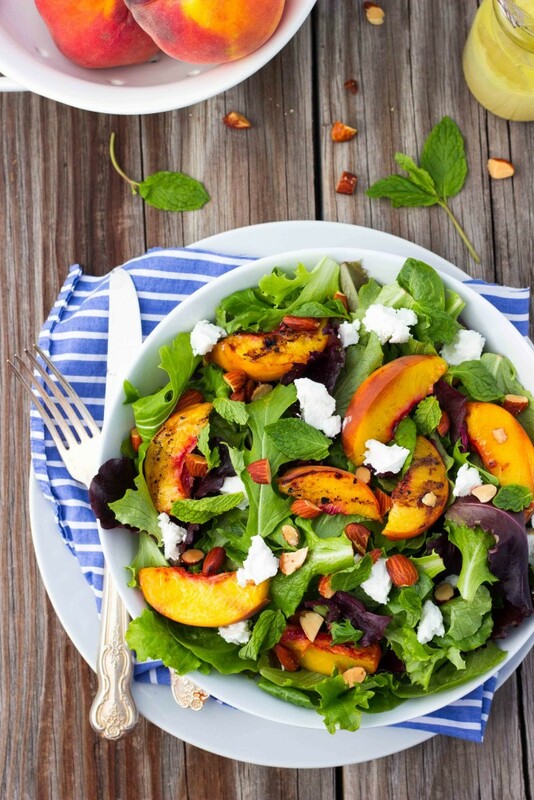 You might not immediately think of peaches when grill season begins, but this flavorful fruit, fresh off the grill, is combined with goat cheese, almonds and mint in a tasty salad perfect for backyard dining. Mix all vinaigrette ingredients in a medium bowl, whisking until combined. Season with salt and pepper to taste. Heat the grill to medium temperature. Cut the peaches in half and remove the pit. Brush the cut side of each peach with a small amount of vinaigrette. Place peaches, cut side down, on the grill for 5-10 minutes, until peaches are slightly heated through. Take the peaches off the grill and cut them into small wedges. In a large bowl, add the spring mix, grilled peach slices, goat cheese crumbles, chopped almonds and mint. Drizzle with desired amount of dressing and toss until everything is combined. Nutrition Analysis: 310 cal, 27 g fat, 5 mg chol, 100 mg sodium, 15 g carbs, 4 g fiber, 9 g sugar, 7 g protein.